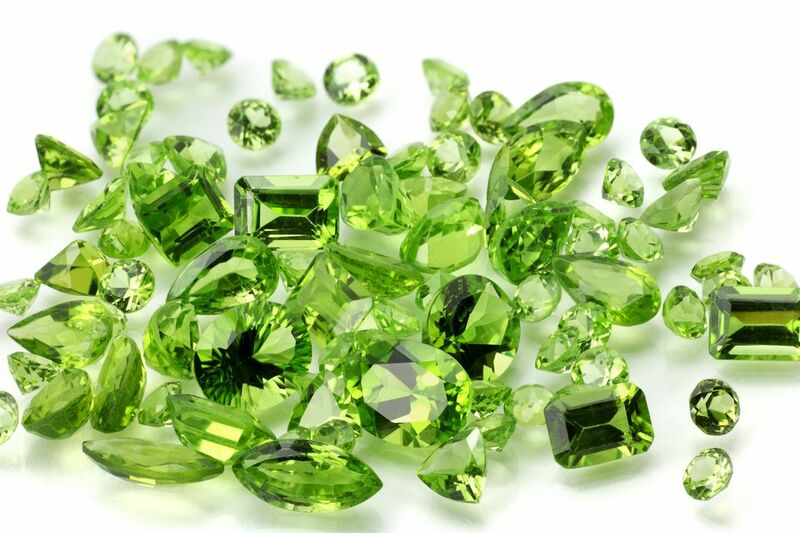 The beautiful green color peridot is one of those rare gemstones that come in only one color. However, the variations of color green in peridot are quite wide -- from light yellow green color to a dark brownish green. Given its color and energetic properties, peridot is often considered a stone for opening the heart, as well as for attracting abundance, family harmony and good luck. A deeper green color peridot is sometimes mistaken for an emerald, and is also often recommended to someone who cannot afford jewelry with emeralds. Found in abundance, peridot is quite affordable as compared to the somewhat similar in energetic properties emerald. Peridot brings the gentle energy of kindness and compassion in a joyful and harmonious kind of way. It helps let go of the old by promoting a sense of renewal and regeneration. This is a stone that is often recommended for times of conflict in romantic relationships, as it helps soothe the energy and bring harmonious resolution to difficult situations. What Is so Special About Peridot? The origins of peridot are quite amazing. As a type of olivine, a mineral that nature provides in abundance, peridot has fiery origins because it comes from lavas. We know of only two gemstones that come from lava versus the earths crust -- diamond and peridot. Some sources also affirm that specific types of peridot have extraterrestrial origins, coming from meteorites. Both origins -- lava and meteorites -- sound very powerful, so you can imagine the energy of this gemstone! It is interesting to note that with all this intensity, peridot first and foremost emits the energy of gentle and joyful healing. It knows how to handle intensity because it is born out of it; and it also knows that the only way to handle intensity is with coolness, compassion and harmony. Color green has always been associated with the energy of the heart, and an open heart responds only with kindness and a joyful, wise acceptance. This is the energy peridot promotes in anyone who is interested in its energies. Where Does Peridot Come From? Peridot is found in many countries around the world, including Australia, Brazil, USA, Mexico, South Africa and China. What Are the Specific Properties of Peridot? The most prominent property of peridot is its joyful and gentle heart opening ability, along with the wisdom to deal with the energy of conflicts and relationship difficulties. Peridot helps clear blockages accumulated in one's heart and opens the way for more grace, beauty and happiness to come into one's life. When it comes in a more yellow color tone, peridot is excellent for working with self-esteem issues. In this case, a long necklace or pendant that reaches the solar plexus area and is worn often can create strong shifts in one's energy body. The yellow color in peridot will also promote a more cheerful disposition for the wearer and inspire more optimism and belief in a brighter future. A peridot with brown color mixed in its green will help with the energy of grounding. As such, it is good for those who may encounter difficulties in being emotionally present in various experiences, as well as with many people in their lives. The abundant energy of the green color peridot is excellent for the purpose of attracting more abundance into one's life. Green is the color associated with abundance, so peridot helps attract abundance while keeping one's heart open and joyful. The wisdom of peridot is about attracting wealth with joy and by following one's true calling, rather than with hard work and persistence. The healing peridot is the birthstone of those born under the astrological sign of Leo, and carries the energy of the month of August. Peridot is also the birthstone of those with the Chinese zodiac sign of Monkey. You can benefit from the energy of peridot in many ways. If you need help with boosting your self-esteem, go for a long beaded necklace or a pendant with a yellow-green color peridot. If you are going through a trying time with many conflicts in your relationships, a bracelet or a ring with peridot can serve you well. And, if you feel you need more gentle, kind energy toward yourself and others, a peridot pendant placed over your heart can help bring the energy you seek.